Seutters depiction of the Duchy of Luxembourg. This is a lovely 1730 map of Luxembourg and surroundings by the important Augsburg map publisher Georg Matthaus Seutter. It extends from Ulmen in Germany west to Rocroi in France and from Amneville, France north as far as Huy in Belgium, covering all of Luxembourg, the eastern parts of Belgium as well as parts of Germany and France. An inset of Luxembourg City in included in the lower right quadrant. The map is color coded according to territories and notes several important cities, rivers and towns with mountains and forests rendered beautifully in profile. An elaborate title cartouche decorates the lower left quadrant of the map. 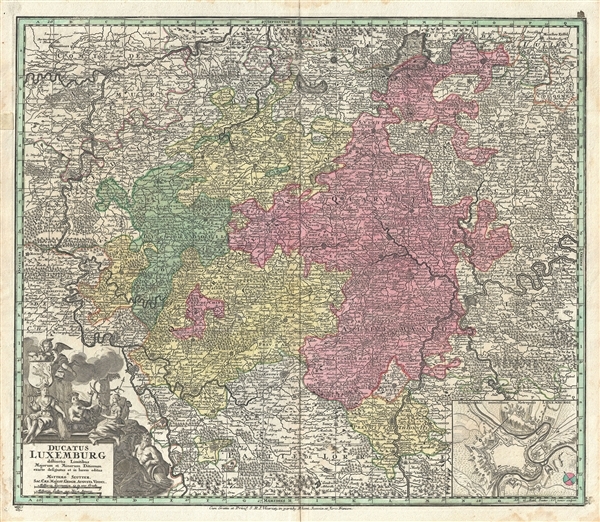 This map was issued by Matthaus Seutter in 1730. Very good. Minor wear along original centerfold. Minor foxing at places. Original platemark visible.